Well, here’s the follow up! Military personnel must not actively advocate supremacist, extremist, or criminal gang doctrine . . . Active participation includes, but is not limited to, fundraising; demonstrating or rallying; recruiting, training, organizing, or leading members; distributing material (including posting on-line); knowingly wearing gang colors or clothing; having tattoos or body markings associated with such gangs or organizations; or otherwise engaging in activities in furtherance of the objective of such gangs or organizations that are detrimental to good order, discipline, or mission accomplishment or are incompatible with military service. So we added examples of basic gang activity to clarify active participation. Knowingly wearing gang colors or clothing; having tattoos or body markings associated with such gangs or organizations are things that all gang members do. The gangsters in the military are usually more advanced that your everyday, run-of-the-mill gangbanger, though. They are members of the Second, and often the Third Generation (see 3G2), and these minor additions will do little (that’s a nice way of saying nothing) to help in their detection, capture and conviction. Then again, there doesn’t seem to have been a full onslaught by the DoD to limit the gang infiltration of the military. 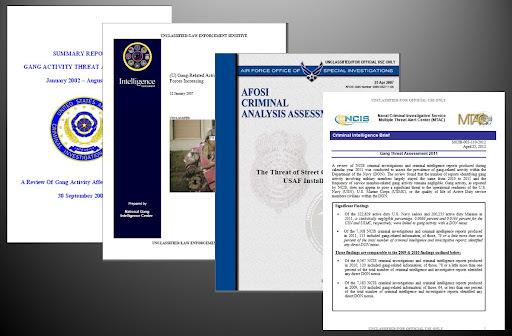 There have been somewhat thorough reviews by each of the branches — Army CID (2004-2009), Air Force OSI (2007), and Navy NCIS (2012) (which included references to Marine CID investigations). Additionally, the FBI has maintained their inquiry into military-trained gang members since 2007. I still think the developing prohibitions are contained in the wrong laws (see previous posts), but at least we are detailing what is active participation — and it makes sense. I anticipate problems with proving the offender was knowingly wearing gang colors or clothing unless there is a mass movement to educate service members on what gang colors or clothing look like — and then requiring them to report what they see. I don’t see that going very far. The easy defense is that gang clothing has now permeated our culture and clothing, tattoos, and even showing a color preference are all more than gang-related choices. The apologists in our DoD investigation units’ public relations departments have been practicing that spin for years . . .
More laws with more teeth directed at more advanced gangs with more investigations — that’s the solution! Presentation titled All grown up but still banging: What issues can we expect if they don’t “age out?” in Nashville, TN on June 13, 2012. Communities everywhere have experienced the negative effects of street gangs. The presence of military-trained gang members (MTGMs) in the community increases the threat of violence to citizens. The problem addressed in this study was the apparently growing presence of military-trained gang members in civilian communities. The purpose of the study was to determine the perceived presence of military-trained gang members and to examine whether there was a relationship between the perceptions of gang investigators regarding the presence and the size of their jurisdictions, the proximity of their jurisdictions to a military installation, and the extent to which investigators participate in anti-gang activities. The statistical analyses used to test the hypotheses in this study were Pearson and Spearman Correlation Coefficients, independent means t tests, and Ordinary Least Squares (OLS) Regression analysis. Respondents reported a mean of 11% of the gang members in their jurisdictions were MTGMs. The Army, Army National Guard, and Army Reserve were identified as the largest sources of MTGMs and the Bloods, Crips, and Gangster Disciples were the gangs most represented. Recommendations included all branches of the military therein should adopt a uniform definition of gangs. Military leaders should acknowledge the increase in gang-related crime affecting the military and address the problems caused for both military and civilian communities without attempting to quantify the threat level. Military leadership should continuously examine the activities of all suspected military gang members to determine active gang affiliation for retention purposes while evaluating any gang affiliation for security clearances. Military Law Enforcement liaison for recruiters should develop effective communication with local, state, and federal law enforcement agencies to assist with information sharing. Communities everywhere have experienced the negative effects of street gangs. Gang activity in the form of crime and violence has had a devastating effect on the lives of citizens and the safety of our communities. The presence of military-trained gang members (MTGMs) in the community increases the threat of violence to citizens. The problem addressed in this quantitative correlational research study was the apparently growing presence of military-trained gang members in civilian communities. The purpose of the study was to more closely examine the nexus between the perceived presence of military-trained gang members and the perceptions of gang investigators regarding the presence and the size of their jurisdictions, the proximity of their jurisdictions to a military installation, and the extent to which investigators participate in anti-gang activities. An online survey, the Military Gang Perception Questionnaire (MGPQ), was created to collect responses from the 260 active members of the Tennessee Gang Investigators Association (TNGIA). The electronic distribution of the survey was facilitated by Google Documents. A sample size calculation was computed for a multiple regression analysis involving seven predictors, a significance level of .05, a power of 80%, and a medium effect size (f 2 =0.15). That power analysis indicated that N =103 was sufficient to detect this size of effect. The statistical analyses used to test the hypotheses in this study were Pearson and Spearman Correlation Coefficients, independent means t tests, and Ordinary Least Squares (OLS) Regression analysis. Many of the 119 respondents felt anti-gang prohibitions would limit the activity of MTGMs. Respondents reported a mean of 11% of the gang members in their jurisdictions were MTGMs. The Army, Army National Guard, and Army Reserve were identified as the largest sources of MTGMs and the Bloods, Crips, and Gangster Disciples were the gangs most represented. There was a statistically significant positive correlation (ρ=.24, p <.05) between MTGM presence percent score and jurisdiction size. There was also a statistically significant positive correlation (ρ=.28, p <.05) between MTGM presence percent score and the distance from the nearest military installation (computed). Recommendations included that military leadership should conduct cumulative tracking and analysis of gang threats, and apply an all-hands approach to identifying gang members in the military. When an installation shows a decrease in gang-related activity, solutions that led to the decrease should be identified. Military leadership should identify and examine all suspected military gang members and policy makers should identify gangs and related groups as Security Threat Groups. Tulare County, Calif. (KMPH News) — Honor, respect and duty to country – three reasons why many valley soldiers are proud to serve, but some recruits are using war tactics they learn in the combat zone on their enemies here in the central valley. One local soldier speaks to KMPH News about his experience and the day he came face to face with a rival gang member in military base in Germany. “My rank is Staff Sergeant, active Army — Walter Huerta,” before Staff Sgt. Huerta was representing red, white and blue he was claiming, a different shade — the color of a notorious gang in Tulare County. The 26–year old grew up in Orosi and spent most of his teenage years on probation, expelled from school for fighting, busted for selling drugs and left his mark all over town as a member of the Norteno Criminal Street Gang. “It finally came down to the point where – at the time my girlfriend was pregnant – and I ended up over–dosing on Meth. I was rushed to the hospital; it was a wake up call. It took a near death experience for me to make a grown–up decision to join the military and get out of here and so that’s what I did,” Huerta said. For the first time in 17–years, Huerta says he felt like he was heading on the right path. “When I finally finished basic training, I got to my unit in Germany,” but even overseas, his former life was staring right back. The young soldier (seventeen at the time) was placed in the same platoon as a rival gang member. Although, Huerta was ready to make changes for the better – others gang members were not. Like in the case of 19–year old Andres Raya, an active–duty Marine and suspected gang member. Investigators say Raya used “military–style shooting” to kill a police officer near Modesto in 2005. Sgt. Howard Stevenson, a 23–year veteran of the Ceres Police Department didn’t have a chance. “In this case, this guy was a killer hiding in a United States Marine Corps Uniform,” Retired Ceres Police Officer Sam Ryno said. Raya was cornered and killed in a firefight with officers. Because of this incident – five years ago — law enforcement agencies across the valley are training their officers to respond to a new kind of threat; gangster with military expertise. “Our swat teams consistently have ongoing training in urban warfare, mountainous warfare and tactical training in situations just like that – the disadvantage to law enforcement is that they are becoming familiar with defensible tactics that we would use when confronted with a threatening situation,” Tulare County Sheriff’s Department Capt. Mike Boudreaux said. Sgt. Huerta says soldiers don’t hide their gang affiliation when they’re overseas or even on base. US Army Recruiter Staff Sgt. Jarrell Smith says standards to enlist are getting stricter. “We don’t what that in the United States Army either and so we try to weed them out the best we can to prevent those guys from getting into the US Army and corrupting our organization,” Smith said. Anyone with a “gang” or “hatred” tattoo can not join and felony charges are also out of the question. But, there are cracks in every system. As for Staff Sgt. Huerta — he and that rival gang member in the same platoon, they are now best friends spreading the same message. Huerta’s big brother Joshua, a Gang Counselor in Tulare County agrees. Staff Sgt. Huerta says he wants to become a gang officer when he retires from the U.S. Army in three years. REPORTER CAN BE REACHED AT NYURIAR@KMPH.COM OR (559) 453–8850. New Presentation, based on LawOfficer.com Feature Article. Although gang members constitute only a fraction of military personnel worldwide, they are a significant problem for the military and communities surrounding military bases. Since the early 1990s, the Armed Forces have taken steps to try to gain control the gang problem. The Secretary of the Army’s Task Force on Extremist Activities conducted an investigation in 1996 and found extremist and gang activity in the Army was causing significant security concerns for many soldiers (U.S. Department of Defense, 1996). Gang members join the military for different reasons. View more presentations from Carter Smith. AGING OUT OR EVOLVING: SHOULD GANG RESEARCHERS COUNT JUVENILE AND ADULT GANG MEMBERS TOGETHER?